Hua Juan, also called flower rolls or scallion flower, is an ancient Chinese dish, a classic home-cooked staple food, both rich in nutrients and delicious. In northern China, steaming buns was a must-have skill for people. Today, this Hua Juan will be very easy to make. You could make this dish with one chopstick. Hua Juan (flower buns) can be either sweet or salty. Sweet with sugar or honey, salty with green onion or ham and so on. As long as you have learned the basics of this hua juan, you can do whatever you want! The hua juan today is going to be made with green onions, so let us start our dish! 7) a small amount of vegetable oil. Step 1: First, making the dough. Flour, salt, yeast, and sugar are mixed in a mixing bow, and water is added slowly. Mix on low for 7 minutes. If you do not have a mixer, you can make the dough by hand using the same procedure: mixing the dry ingredients first, and then slowly adding water. Check out another dough recipe to get more details. Step 2: After mixing, the dough should look like the picture above. The amount of water should be closely monitored, as each flour is different; however, do not make your dough for this dish too soft. Step 3: Place the dough into a large bowl, cover with plastic wrap, and let sit at room temperature to rise about 2.5 times larger. Step 4: Roll the air out of the dough, sprinkle with a little flour to prevent sticking and cover with plastic wrap for 15 minutes. Then roll into a square shape as shown above. Step 5: Apply a layer of vegetable oil evenly on the surface of the dough. Step 6: Sprinkle on the desired amount of green onions evenly across the dough. Step 7: Fold in one side, and begin to gently roll the dough. Step 8: After fully rolled, it should look similar to the picture above. Step 9: Cut the rolled dough into 12 portions. Step 10: Stack 2 of the pieces, one on top of the other. Step 11: Using a chopstick, press down in the middle as shown above. Step 12: Press the chopstick all the way down. 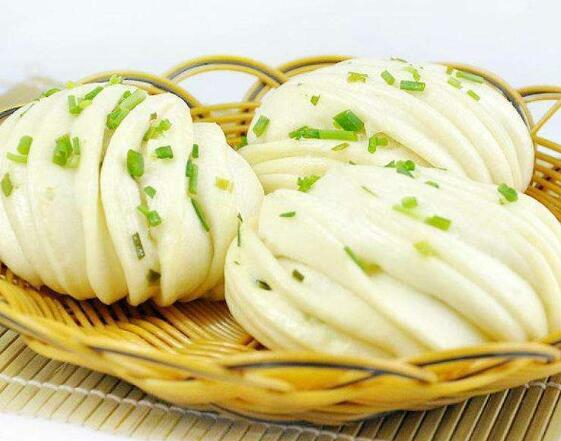 The dough at this time can be directly risen and steamed, which is a common shape of hua juan. If you want to further shape, you can follow the steps below. Step 13: Grab each end of the roll, and gently stretch a little. Step 15: Finally, fold the ends downward and pinch the ends together. Step 16: After the Hua Juan is done, placed on the oiled steamer (allow enough distance between so they do not cook together). Cover the surface with a damp cloth and let sit for 30 minutes in a warm place. Step 17: Once they have risen to twice the size, you can steam. Turn on the heat, and when the water begins to boil, steam for 18 minutes. After steaming, turn off the heat, wait 2 minutes and then open the lid to avoid the hua juan collapsing. 1: You can add whatever you like to the Hua Juan. If you do not like green onions, you can use ham and salt and pepper. If you would like something sweet, you could use cinnamon and sugar and raisins. 2: It is best to enjoy these along with something else to compliment the flavors, such as steamed vegetables with the rolls.